I have been working with glass for many years and am always keen to keep my techniques updated. Having lived in North Devon with my husband since 1970 and brought up our four children, I then studied with the OU for over 10 years. I successfully gained my MA (Education) and taught chemistry/science at the local secondary school for many years before expanding my more creative interests. Venturing into the new area of working with fused glass in 2001 has brought such an exciting phase into my life. My background as a science teacher and, previously as a stained glass artist, has given me an understanding of the manufacture of glass and its properties, which in turn has enabled me to develop a product that I am proud to display. My studio has evolved over the years where it has become a comfortable and easy space to work in, plus a place to encourage the flow of inspirational ideas. Views inside my studio. 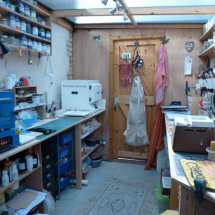 I now have 2 kilns and an area where I can work with glass rods and a flame to produce lampwork beads.